Umbilical instrument inspection uses an "intelligent" scraper, shown here. 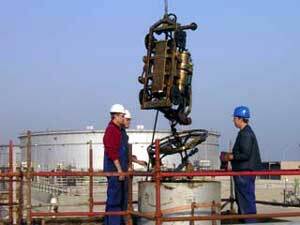 RAS TANURA, SAUDI ARABIA (February 03, 2005) - A new pipeline inspection technology is helping Saudi Aramco ensure the uninterrupted loading of oil at sea islands. 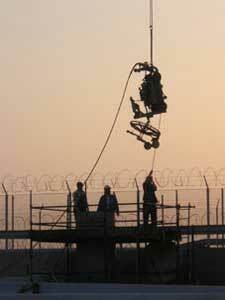 It also has potential applications throughout Saudi Aramco. Beginning in December, five crude-oil-loading pipelines at Ras Tanura Terminal South were inspected with an umbilical instrument scraper. It was the first widespread use of the technology on sub-sea pipelines in Saudi Aramco. Umbilical instrument inspection uses an "intelligent" scraper attached to a cable to measure the thickness of pipeline walls. The technique was developed for pipelines that had previously been considered "uncrapable." The inspection indicates that the five pipelines, totaling 18 kilometers, are free from major defects and can be operated without restriction. The scraper is attached to a cable to measure the thickness of pipeline walls. With the completion of this inspection, a new standard for assessing sub-sea pipeline integrity was established. The viability of the umbilical scraper for the rest of the Terminal Department's sub-sea pipelines will now be evaluated. The inspected pipelines were installed beginning in 1962, and since then, billions of barrels of oil have been shipped through them. Flexibility and dependability in loading is the key to customer satisfaction, and these pipelines are the heart of providing that flexibility and reliability. With this inspection, Saudi Aramco has thoroughly revalidated the integrity of the pipelines and ensured reliable crude-loading operations. The process also carries an environmental advantage. The inspection parameters were designed to find thin areas in the pipelines and thereby prevent leakage into the sea.